I don’t have a mind for numbers. I love the idea of math and theoretical puzzles and problem solving, but I just can’t wrap my head around the numbers. If you’d like me to mimic the stand up routine I saw once last year, I’m your guy, but I most definitely couldn’t tell you the formula that I learned a few hours ago. I’m sure this is self-fulfillment on my part, I don’t think I’m good at math so I’m not, but really it’s been that way as long as I can remember. When I was getting into brewing, seeing all of the numbers involved was frustrating and daunting. I remember looking at a “build your own recipe” sheet which had you work backwards from gravities and SRMs to make your grain bill. Then I had to figure out efficiency, attenuation, hop utilization, all those good old formulas that play central rolls in brewing good beer. Thank God for calculators. I don’t know what I would do without them. I’d learn the math eventually if need be, but you just can’t replace the convenience of BeerSmith or a good yeast pitching rate calculator. Unfortunately, in wood aging, there aren’t many calculators out there for the sort of work we are hoping to do and so I had to look into the math myself. Let’s say I buy a barrel, 5 gallons, and rack a nice English Barleywine into it. Per all of the barrel aging instructions I see, I let it sit for a year, topping off the Angel’s Share. After that year, I sample, and the oxidation is intense to the point where it could pass as an Old Ale, but would definitely still be labeled oxidized because of the heavy sherry/port characters. And we haven’t even mentioned the overpowering oak and rye alcohol characters. So what happened? Not all barrels are created equal, especially when it comes to barrel sizes. See, in the barrel, oxygen is exchanged through the wood. That oxygen exchange is often desirable, but as we see in our example it can quickly get away from you. The issue is that I treated a 5 gallon barrel like a 53 gallon barrel, and didn’t account for the higher oxygen exchange rate. I also didn’t calculate out the surface area, and the wood was overpowering in one instance where it may not have been in another. To solve this problem, a lot of brewers will cover a portion of their barrel in paraffin wax. Paraffin wax is a food-safe wax that we can use to cover a portion of the barrel, “sealing” it and lowering the rate of oxygen exchange. By doing some pretty simple math, we can approximate how much of the barrel we need to seal in order to mimic the exchange rate of a larger barrel. Where d is the diameter of the head of the barrel, H is the height of the barrel, and r is the radius of the head of the barrel (or half the diameter). I originally saw this formula used by /u/brouwerijchugach, author of the blog Brouwerij-Chugach and incredible brewer of all things sour. Basically, by using this forumula, you calculate the surface area of the barrel (in square inches) and place it against the surface area of a full sized barrel, which helps you estimate the approximate aging time compared to a full-sized barrel, thus determining what percentage of your barrel you need to paraffin wax in order to replicate the oxygen exchange (which will lengthen the aging time). Now with edits from Eric of Eric’ Brewing Blog! Canadian Brewer extraordinaire, who pointed out that the formula failed to take volume into account. In practice: You’ve got a new 10 gallon barrel that has a head diameter of 14″ and a height of 18″. Plugging these numbers into our formula, you determine that there are 1099 square inches of surface area. Your standard whisky barrel is usually 53 gallons, with a 21″ head diameter and 36″ tall, which works out to be about 3066 square inches. So, to replicate the larger barrel, you would need to paraffin wax roughly 47% of the barrel. 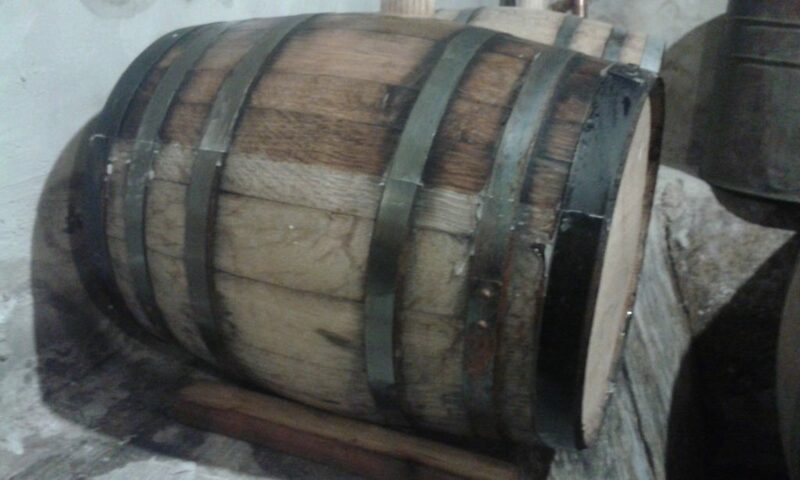 In Practice: We have our freshly used 10 gallon barrel, with a surface area of 1099 square inches. Plug that into our formula, and instead of covering 47% of the barrel, we can age for 192 days. Now, in loose and unexamined theory, these two methods would give you the same finished beer. They will not. Oxidation isn’t equal, and a beer aged for 3 months isn’t the same as a beer aged for 12 months. Also, paraffin waxing does nothing for the oak characters in the beer, which are still fresh and will be stronger in a smaller barrel due to the higher surface area to volume ratio. Those issues need to be addressed themselves. This is less a formula, and more an explanation that I found interesting. 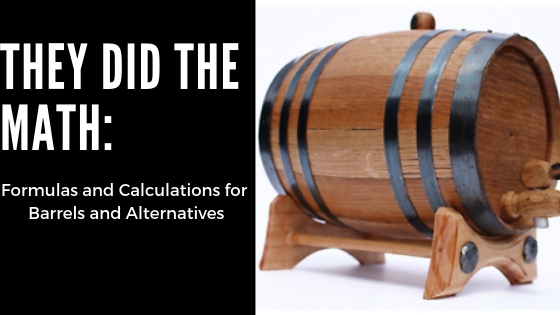 A friend, /u/Chino_brews of Reddit, brought up in the BrewUnited forum that barrel alternatives (cubes, specifically) are used in different quantities than full sized barrels in terms of surface-area to volume ratios:This blog post seems to indicate that a 59-gallon wine barrel corresponds to a barrel surface area to volume of 54 square inches per gallon.It seems like an oak cube averages around 0.75 square inches each (they average around 0.5″ x 0.375″ x 0.25″ based on my samples). So 72 cubes per gallon? That is about 10-11 oz. per 5 gallons and seems way out of line with recommended usage rates.This article from MoreWine suggests that 2.5 to 3.0 ounces per gallon corresponds to “new barrel” extraction rates. So that checks out, 77 cubes per gallon (or roughly 13-14 oz of cubes for a 5 gallon batch) is way more than any recommended rate I’ve seen. What gives? Why are barrel alternatives not in line with barrels? Why aren’t the surface areas at least somewhat equal? In my in-no-way-beyond-question opinion, the answer is penetration and grain. In your average barrel stave, beer will typically only penetrate up to 6mm. Our surface area calculations earlier do not account for the penetration, just the initial surface. With staves, beer is only in contact with one side, and so it only sinks in those 6mm and then stops (not really, more goes on with oxygen exchange but for the purpose of the explanation it stops). But cubes are different, they are submersed in beer, so they are thoroughly soaked in beer. The 6mm penetration is on all sides, and so there is more going on in the core of the wood than with a barrel. Think of a stave from a barrel. If your average homebrew stave addition is about 8″ tall and 1″ in diameter, it has a surface area of about 27 square inches. In a barrel, the length of that stave would be in contact with the beer, but the width would only be penetrated up to .2 inches on one side. That’s a lot of stave that isn’t in contact with the beer. But out of the barrel, sitting in your fermenter, that stave is penetrated .2 inches on all sides. The other issue here is the grain of the wood, pointed out to me by Chris of Northern Brewer. If you’re not familiar, the grain of wood refers to the direction of the wood cells and the cut of the wood. These are typically three categories: end grain, face grain, and side grain. If you look at the wine barrel stave image on the right, you’ll recognize the three. On the “top” of the stave, you’ll see the face grain. The sides of the staves are side grain, and the slanted part where the wood was cut is the end grain. The part of the stave that is in contact with the beer in a barrel is the face grain, and liquid penetrates this part of the wood up to eight times slower than the end grain. Cubes, however, have all the grains. They’re chopped up, all faces are present, and so in addition to being penetrated more thoroughly, they are also penetrated quickly because of the exposed end grains. The fact of the matter is that barrel alternatives are just not the same as barrels. I’m a huge advocate for barrel alternatives in homebrewing, but they aren’t a perfect substitution. As pointed out by Matt of the blog Accidentalis Brewing, temperature fluctuations also come into play here. Barrels are often exposed to more extreme (relative to wood additions) temperature fluctuations than wood additions, and the hot/cold shift can cause the grains to expand/condense, adjusting the rate at which liquid penetrates the wood. Often, wood additions are in the same temperature controlled environment as the primary fermenter, and the pores of the wood are not changed as often. Couple this with the fact that the surface area of wood additions and the surface area of barrels exist in different conditions. Barrels are the vessel. They aren’t just used to add wood character to a beer, they’re used to store a beer, and as such, they have contact with oxygen that the barrel alternatives don’t have. The oxygen exchange, also affected by those temperature fluctuations, changes the character in your beer. The oxygen exchange of barrel additions is negligible, only the oxygen in the addition matters and it is near zero. The exchange of a barrel versus the exchange of a plastic fermenter versus the exchange of a glass fermenter are all different, and so this exchange obviously impacts the time you want to age your beer to get the same character, keeping in mind that a beer oxidized quickly will be different than a beer oxidized slowly. If, like me, you don’t like math then this will help you out. I’ll update the spreadsheet as it goes on, and it might turn into something else, but for the time being, the spreadsheet can be found here. Now, like the formulas it is based off of, the spreadsheet is an approximation. Always take notes, always dial in your individual preferences and system.